Corny title? Well-ll yes. But it seemed a good idea at the time…and it seems it caught your attention? 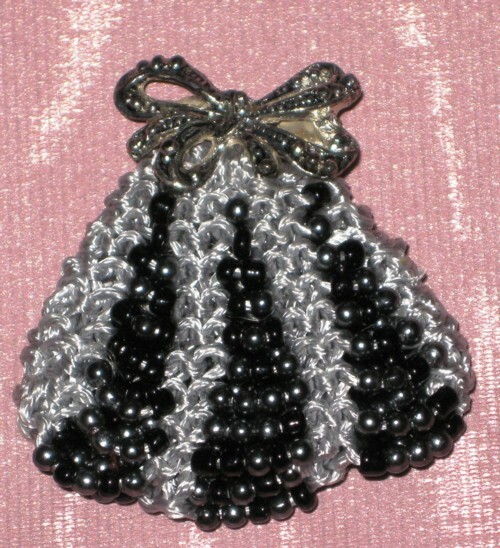 If you are already a Bead Knitter or possess a beaded item, you will know just how beautiful these treasures are – and certainly understand my descriptions in my Ezine article Knit One, Bead One . Hopefully even the most knowledgeable ‘eye’ will appreciate some of the variations I have created on some basic themes. Almost all of the time, I’m perfectly satisfied to be at the ‘granny stage of my life – HOWEVER – when I’m crafting (and writing) I would happily be 20 years younger – complete with all the knowledge, experience and skills of today. Aargh! and curses, etc., etc. Life just doesn’t play out like that, does it? In all honesty, I am tremendously grateful to have the capability of following any and all of the pursuits as I wander down my particular path. I don’t have to look far to see how it all could be – or could have been, in the past that shaped all I am today. Thankfulness is certainly an appropriate thought for the Thanksgiving Day being celebrated so heartily by our American friends. If only we could all find our own personal ‘thankfulness’ to hold deep inside – EVERY day of the year. Let’s try harder to do just that…huh?